Pioneers in the industry, we offer Bio Gas Energy Generation from India. Biogas is another clean and renewable source of energy which produces less greenhouse gas emissions or waste products. Methane is several times more dangerous to environment as compared to carbon dioxide. Biogas system traps this very methane which is finally converted to carbon dioxide after burning, thus reducing the greenhouse effect. 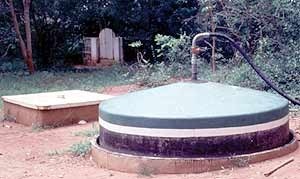 There is no concept of waste in biogas as the final stream can be disposed with little treatment or it can be used for irrigation. Similarly the solid waste serves as organic fertilizer. So there are more win win situations here. Payback period varies from two years for smaller systems to four years for larger ones. We provide low cost economical solutions for biogas generation. By: Shreeji Hevy Project Bus Ltd.